The Ministry of Finance has released the Report of the Working Group on Foreign Investment, led by U. K. Sinha. The materials of the conference are up at the conference web page. All the papers are in. All the slideshows will come on in a few days. I have an article in the Financial Express today titled Breaking with a dysfunctional business model, about the fundamental problems of insurance companies and mutual funds in India. Tom Wright and Siobhan Gorman in the Wall Street Journal on new thinking by Pakistan's ISI about who is enemy #1. Tamal Bandyopadhyay in the Mint on the campaign against C. B. Bhave. Also see Ashok Desai and Mahesh Vyas on these issues. A. K. Bhattacharya in the Business Standard on the crisis of project management in government. This is what animates Nandan Nilekani's TAGUP group and I hope this induces fundamental change in Indian public administration. Also see. Fascinating new research by Devesh Kapur, Chandra Bhan Prasad, Lant Pritchett and Shyam Babu, written by Ila Patnaik in the Financial Express. Jayanth Varma is dismayed at RBI's lack of modern finance knowledge in thinking about CDS. India on the FATF high table by K. P. Krishnan, in the Economic Times. Neelasri Barman and Parnika Sokhi in DNA about the most important question in RBI reforms: that of HR practices. Roughly 30 years ago, RBI used to do direct recruitment at middle management levels. When the union became powerful and recruitment became restricted to the entry level, it had greatly damaging consequences on the organisation's capability. If the HR falls into place with really top quality people, then all the needed RBI reforms will rapidly get done. William Dalrymple in the New York Times on Sufis. Jeffrey Goldberg in the Atlantic magazine about the task of stopping Iran's nuclear capability. Jeff Frankel says that we have a lot to learn from small countries. Damon Darlin in the New York Times tells the story about how Netflix worked on video over the net even though this directly competed with its profitable DVD-by-post business. Javier Blas and Greg Farrell in the Financial Times on the interesting role of agricultural commodity futures in the recent flareup of prices. RBI has a discussion paper on opening up banking for entry by private banks. See responses by Jayanth Varma in the Financial Express and by Ila Patnaik in the Indian Express. Also, a less coherent response from me on TV. A nice feature of the above RBI URL is that it also links to the January 1993 guidelines on entry of new private banks and the January 2001 guidelines. Striking a balance between avoiding crooks and theft, and ensuring competition, is hard. It's easy to go to either extreme, but the puzzle lies in finding the middle road. These are the political and governance challenges that India must now grapple with. Raghuram Rajan's book Fault Lines (Princeton University Press for the international edition, and Harper Collins for an Indian edition with a special chapter on India) is possibly the most thought-provoking contribution in the aftermath of the economic and financial crisis that has engulfed the West after 2007 with significant global repercussions. The crisis has resulted from a confusion about the appropriate roles of the government and the market. We need to find the right balance again, and I am hopeful we will. The key idea of Fault Lines is to focus on slow-moving tectonic plates in the global economy: consumption by borrowing in countries with fiscal deficits, excess savings in exporting countries that are fiscally in surplus, and growing sophistication of the financial sector. None of these movements might seem dangerous in itself, but when these plates come together and collide, the global economy can get badly shaken. To most players focused narrowly on their own positions, leave alone the movements of the plate they stand on, the earthquake - like this crisis - may seem an unfortunate happenstance. In the analytical framework of Fault Lines, the crisis was not a pure accident and that more severe crises could arise in future unless the root causes are addressed sufficiently soon. The book presents two important government distortions in the global economy and their underlying causes. These are (i) the push for universal home ownership in the United States, and (ii) export-led growth in countries such as Germany and China. Together, these policies have led to massive "global imbalances", with some countries such as the United States, the United Kingdom and Spain persistently being in deficit, and borrowing from the surplus, exporting nations. While pursuit for home ownership affordability and growth do not necessarily have to be distortionary, the book makes the sharp observation that these have been occurring at the expense of something more important but subtle. In the United States, there has been growing income inequality, which combined with a relatively feeble safety net for the poor and unemployed, has created pressure on politicians to find quick ways to bridge the inequality. Instead of improving the long-run competitiveness of labor force for a global market with a changing mix of industries and required skills, governments have adopted the short-run option "let them eat credit" (the title of Chapter One). The presence of government-sponsored financial firms in the United States (Fannie Mae and Freddie Mac, in particular) enabled exercising such an option readily through a push for priority lending to the low-income households (sub-prime mortgages). In case of surplus countries, it has been the problem of exporting to grow (the title of Chapter Two). Their single-minded focus on exports has led governments to ignore the domestic sector, preventing sufficient redeployment of surplus for internal development, and somewhat perversely, even boosted domestic savings rates significantly due to lack of adequate safety nets (at least in case of China, if not in case of Germany). As someone mentioned in a recent dinner conversation: Each child in China is saving to fund post-retirement expenses not just of two parents but also of four grandparents. These savings have thus had no place to go but outside, giving rise to massive capital inflows that fueled the housing sector expansion in the US, the UK and Spain. What is fascinating is that Fault Lines explains how these lop-sided government policies of two separate sets of countries have interacted with each other - and with the financial sector - in fueling the expansion to levels of unsustainable housing bubbles. The idea here is that the invisible hand operating through the price when the price is distorted can also lead to massive distortions in the allocation of capital. The financial sector in developed world is so sophisticated and amoral (a great choice of word by the author) that its dispassionate pursuit of profits leads it to direct capital to wherever there is a relative mis-pricing. So if governments are subsidizing home ownership, efforts will be made to deploy all free capital of the world to the housing sector. If some governments are finding it cheap to borrow because savings are seeking them out, the financial sector will grow at a sufficient rate to absorb and support expansion of housing credit through these capital inflows. Clearly there have been incentive-based distortions in the financial sector, especially due the short-term nature of accounting-based compensation that ignores true long-term risks. The book explains, however, that the bigger issue was something else: that the imbalance of capital flows and the ease of pushing sub-prime home ownership - both due to government distortions - meant the financial sector was essentially a conduit to making happen what the rest of the world was seeking to achieve. In the process, banks made a ton of bad loans (but the governments were happy with that till it all really blew up). And some parts of the financial sector pursued this role even more aggressively than one could have imagined due to the steady entrenchment of too-big-to-fail expectations -- large banks being repeatedly bailed out through government forbearance and enjoying central-bank monetary stimulus each time markets turned south. Some may question the basis of this argument by saying - why did we see credit expansion across board and not just in low-income households? Here, Fault Lines focuses on a rather fascinating phenomenon that recoveries from recent recessions, especially in the United States, have remained "jobless" for extended periods of time. Perhaps as a subconscious response to this (or due to ideologies in other cases), central banks have tended to provide massive monetary stimulus to get the financial sector to push the household consumption and real sector investment harder and harder through greater lending and intermediation. Such stimulus, unfortunately, again serves to transfer rents from households to the financial sector (by keeping interest rates low) and produces mispriced risk. Thus, the economy moved "from bubble to bubble" (the title of Chapter Five), until the most recent bubble could not be mopped up by anyone, not even the most innovative Central Bank of all, despite its own best efforts. In essence, Fault Lines connects the dots visible to all of us in a rather ingenious manner to provide an explanation of what brought about the perfect storm we have recently weathered. While the book is worth it even just for its explanation of why we had a crisis now rather than at some other points of time, it goes the extra mile and proposes valuable reforms, focusing on all three issues: building a better safety net in the United States (see in particular, the suggestions to improve education access to all and extend a greater level of unemployment insurance), reducing the global imbalances, and improving the regulation of the financial sector so that it (and its financiers) pay for mopping up of bubbles it fueled, rather than governments and Central Banks passing on these costs to taxpayers. The book also helps understand why export-based Chinese and German growth, and their effective vendor financing of consumption in the US and Euro-zone countries, may ultimately face limits as consumption slows. These countries are now being forced to become the stimulators of growth and run the risk of planting seeds of bubbles in their own economies. This is how hidden fractures still threaten the world economy, as the book's subtitle goes. It also leads one to reconsider that India's slower growth rate than China, while not entirely faultless, might however be more balanced given its lack of extreme export reliance. Raghuram Rajan's writings are always cogent and based in sound set of facts. But this book is special in the sense that here he paints on a much larger canvas, covering bases from distributional issues within income strata of society, to the persistent capital imbalances across large countries of the world, and the ruthless profit-maximizing incentives of modern market-based financial sector. There is a lot going on in the book. But it is written with great examples and cases - almost lyrical at times (even has a fascinating poem recounted in the chapter "The Fable of the Bees Replayed"), and should be accessible to one and all. It will certainly question some long-held biases about current state of economic conditions in Western countries. But it is hard to not take a deep breath and ponder once you have read it all. In many ways, it shows that when economic conditions so demand or induce, the developed world behaves much the same way as the developing world: they are both after all driven by choices of human beings and the book lays out some common patterns of global economic behavior - in households, markets and governments. In the Financial Express today, I have a piece on India's middle income trap: Don't take growth for granted. Coincidentally, on the same day, T. N. Ninan in the Business Standard had a piece on a similar theme, and in the Indian Express, Shekhar Gupta ponders where UPA-II went astray. My thinking about these questions in recent weeks has been prodded by questions about entry of private banks, and by the campaign against C. B. Bhave. by Bindu Ananth and Nachiket Mor. Much has been said about the astronomical SKS valuations and the personal fortunes of the original investors. Speaking for ourselves personally, we are not at all disturbed by how much money was made by whom. On the contrary, we are very excited that an area that was once thought to be the exclusive turf of, as Monika Halan (http://bit.ly/SquidorDevta) puts it so graphically in Mint, `the nexus of political doles and the rural bank branch system rotting under the weight of corruption and dysfunction' thanks to pioneers like Vikram Akula, Padmaja Reddy and Udaya Kumar, has moved firmly into the domain of `mainstream commerce'. People forget that we are a country of over 500 million very-very poor people, so very large amounts of equity capital are required in building an ecosystem of financial firms which will serve the poor of India. Now that the ball has been tossed up high in the air we are hoping that other people who also know how to build India sized businesses (Ratan Tata, Kumar Birla, Mukesh Ambani, Sunil Mittal, Azim Premji and several others) take notice of this ball and hit it with all the power that they can bring to it. Curiously, the fact that so much money was made and was seen to be made is good news because this kind of money even makes the big boys sit up and take notice. Preventing Vinod Khosla or Vikram Akula from making some money is not going to eradicate this poverty, but the power of their ideas taken to scale will. Should we then not be concerned at all about how much money was made? For sure! Not because somebody got rich but because it calls into question the oft-stated MFI position that their high interest rates are only just about covering their high operating costs. A paper (http://bit.ly/Nvw6k) by Chaudhary and Rai shows that valuations are very sensitive to interest rates. They show that just a 1% decline in MFI interest rates leads to a Rs. 1.5 billion drop in valuation for an MFI with 500 branches. They also show that should the large MFIs choose to cut interest rates by as much as 10% (from the over 30% per annum that most of them currently charge, to under 20% per annum), they would still deliver a holding period return on equity of over 25% per annum. The focus on individuals making money distracts our attention from this very important fact. And attempts that are intended to bring about `orderly conduct' (http://bit.ly/MFINCode) could have the consequence of preventing competitive forces from coming in and bringing these rates down there is a real need to make sure that this does not happen and to actively encourage intense competition amongst new and existing players. Experience, for example with housing finance in India, shows that this was the only reason why the rates fell and services standards improved without any dilution of credit quality. There is also an urgent need to bring in completely new models of financial services for low-income households (we are associated with one such attempt: www.bit.ly/LocalTouch). For example, the rapid scale-up of ATMs in India changed the entirely banking landscape by changing the very nature of the service models. Bindu Ananth (bindu.ananth@ifmr.co.in) is the President of IFMR Trust (and the corresponding author). Nachiket Mor is the non-executive Chairman of the Governing Council of IFMR Trust and the President of ICICI Foundation for Inclusive Growth. Views are strictly personal. On 5 August, the RBI Governor did a speech in Hyderabad. I was disappointed in reading this speech; it suggests little learning of monetary economics amongst RBI staff after the 1960s. See this response by Ila Patnaik. A few recent papers look at these things very differently: John Taylor (June 2010), Takatoshi Ito (July 2010) and Asli Demirgüç-Kunt and Luis Servén (February 2010). We continue to be in a situation where RBI's thinking on monetary policy is quaint and out of touch with world class knowledge of economics. Reality is a complicated nonlinear relationship in many dimensions. Each randomised experiment illuminates the gradient vector in one small region. It's hard to generalise the results (i.e. low external validity). I am quite worried about the bang for the buck obtained through this strategy. A lot of money is spent, which could have other uses in funding dataset creation or research. Economics is a bad field in having low standards of replication. The journals don't publish replication, which is the foundation of science. Randomised experiments, too often, generate proprietary datasets which are controlled by the original authors. The scientific progress which comes about from multiple scholars working on common datasets does not come about easily. But sophisticated experimentalists understood that because of the issue's high causal density, there would be hidden conditionals to the simple rule that `mandatory-arrest policies will reduce domestic violence.' The only way to unearth these conditionals was to conduct replications of the original experiment under a variety of conditions. Indeed, Sherman's own analysis of the Minnesota study called for such replications. So researchers replicated the RFT six times in cities across the country. In three of those studies, the test groups exposed to the mandatory-arrest policy again experienced a lower rate of rearrest than the control groups did. But in the other three, the test groups had a higher rearrest rate. Criminologists at the University of Cambridge have done the yeoman work of cataloging all 122 known criminology RFTs with at least 100 test subjects executed between 1957 and 2004. By my count, about 20 percent of these demonstrated positive results: that is, a statistically significant reduction in crime for the test group versus the control group. That may sound reasonably encouraging at first. But only four of the programs that showed encouraging results in the initial RFT were then formally replicated by independent research groups. All failed to show consistent positive results. I am all for more quasi-experimental econometrics applied to large datasets, to tease out better knowledge by exploiting natural experiments. By using large panel datasets, with treatments spread across space and time, I feel we gain greater external validity. And, there is very high bang for the buck in putting resources into creating large datasets which are used by the entire research community, with a framework of replication and competition between multiple researchers working on the same dataset. You might like to see a column in the Financial Express which I wrote a few months ago, with the story of an interesting randomised experiment. In this case, there were two difficulties which made me concerned. First, this was not randomised allocation to treatment/control: there was selectivity. Second, it struck me as very poor bang for the buck. Very large sums of money were spent, and I can think of myriad ways to spend that money on datasets or research in Indian economics which would yield more knowledge. This is 31 August and 1 September; here is the program. From 6 to 10 September, we have a pair of mini courses: Sanjay Banerji will teach on financial crises, and Sourafel Girma will teach on the new quasi-experimental econometrics. On 14 September 2010, we have the NIPFP Macroeconomics Symposium. Understanding the ADR premium under market segmentation by Matthieu Stigler, Ajay Shah and Ila Patnaik. The abstract reads: Capital controls can induce large and persistent deviations from the Law of One Price for cross-listed stocks in international capital markets. A considerable literature has explored firm-specific factors which influence ADR pricing when LOP is violated. In this paper, we examine the interlinkages between Indian ADR premiums and macro economic time-series. We construct an ADR premium index, whereby diversification across firms diminishes idiosyncratic fluctuations associated with each security. We find that the S&P 500 index and the domestic Nifty index influence the ADR Premium Index. Positive shocks to the ADR premium index precede higher purchases by foreign investors on the domestic market, and precede positive returns on the domestic index. Many practitioners in India believe that net FII flows matter greatly to stock market returns. But this belief is not borne out when you carefully look at the evidence. The VAR in the above paper says this one more time: in the context of the specification used in this paper (aimed at uncovering insight into a different issue, the ADR Premium) you don't see an impact of a rise in net FII flows upon stock prices. On an interesting story about the ADR Premium for one stock (as opposed to macroeconomic thinking), see: Spike in the ADR Premium on Tata Motors by Anmol Sethy. You might like to see: the stock of papers from the NIPFP Macro/Finance Group. Monetary policy in an uncertain world: Probability models and the design of robust monetary rules by Paul Levine. The abstract reads: The past forty years or so has seen a remarkable transformation in macro-models used by central banks, policymakers and forecasting bodies. This paper describes this transformation from reduced-form behavioural equations estimated separately, through contemporary micro-founded dynamic stochastic general equilibrium (DSGE) models estimated by systems methods. In particular by treating DSGE models estimated by Bayesian-Maximum-Likelihood methods I argue that they can be considered as probability models in the sense described by Sims (2007) and be used for risk-assessment and policy design. This is true for any one model, but with a range of models on offer it is also possible to design interest rate rules that are simple and robust across the rival models and across the distribution of parameter estimates for each of these rivals as in Levine et al. (2008). After making models better in a number of important dimensions, a possible road ahead is to consider rival models as being distinguished by the model of expectations. This would avoid becoming `a prisoner of a single system' at least with respect to expectations formation where, as I argue, there is relatively less consensus on the appropriate modelling strategy. A Floating versus Managed Exchange Rate Regime in a DSGE Model of India by Nicoletta Batini, Vasco Gabriel, Paul Levine and Joseph Pearlman. The abstract reads: We first develop a two-bloc model of an emerging open economy interacting with the rest of the world calibrated using Indian and US data. The model features a financial accelerator and is suitable for examining the effects of financial stress on the real economy. Three variants of the model are highlighted with increasing degrees of financial frictions. The model is used to compare two monetary interest rate regimes: domestic Inflation targeting with a floating exchange rate (FLEX(D)) and a managed exchange rate (MEX). Both rules are characterized as a Taylor-type interest rate rules. MEX involves a nominal exchange rate target in the rule and a constraint on its volatility. We find that the imposition of a low exchange rate volatility is only achieved at a significant welfare loss if the policymaker is restricted to a simple domestic inflation plus exchange rate targeting rule. If on the other hand the policymaker can implement a complex optimal rule then an almost fixed exchange rate can be achieved at a relatively small welfare cost. This finding suggests that future research should examine alternative simple rules that mimic the fully optimal rule more closely. Two striking stories in India's crisis of governance: Sadanand Dhume in the Wall Street Journal on the Commonwealth Games, and Nilanjana S. Roy in the New York Times on the personal safety of women. The deep determinants of the problems of India's economy lie in the political system, and the deep determinants of the problems of Indian politics lie in the way elections work. One of the many blunders of our Constitution was the use of first-past-the-post in elections. See Anthony Gottlieb in the New Yorker magazine. Ila Patnaik has four recent pieces: Capital controls and unhedged currency exposure on the new India Policy Forum website; The Mauritius code (in the Indian Express) on a fresh approach to thinking about the Mauritius treaty; concerns about inflation in the Financial Express and a piece on inflation targeting aimed at the white paper readership of the Indian Express. A while ago, paypal had figured in my list of things that were banned in India. They have announced a workaround : for payments made to customers in India, they will use snailmail and send out a cheque. And so the 20th century payments innovation will be reduced to a 19th century solution. The frontiers of Nifty, by Ashish Rukhaiyar in the Business Standard. Mahesh Vyas in Financial Express about criticism of SEBI. Devika Banerji in the Business Standard about the changing world of the economics think tanks. Bibek Debroy in the Financial Express on the rupee's new symbol. Didi Kirsten Tatlow on the struggle to remember, in China. Also see America and China in 2020 by Ian Bremmer. Jayanth Varma has a chapter in a Robert Kolb book. I wrote a comment on the `Economics | by invitation' system run by The Economist, on their question: What will it take to convince emerging markets to halt reserve growth?. Dream-logic, the Internet and artificial thought by David Gelernter, on Edge. Protests have broken out in France against the government's ban on the `burkha'. A while ago, I had argued that world food price vol had risen and would rise further. It looks like the evidence is in favour of that proposition. See: What explains the rise in food price volatility? by Shaun K. Roache. A great piece in the Economist about Europe's future. Milan Kumar Biswas, General Manager of Keggfarms Pvt. Ltd. knows something about inflation. 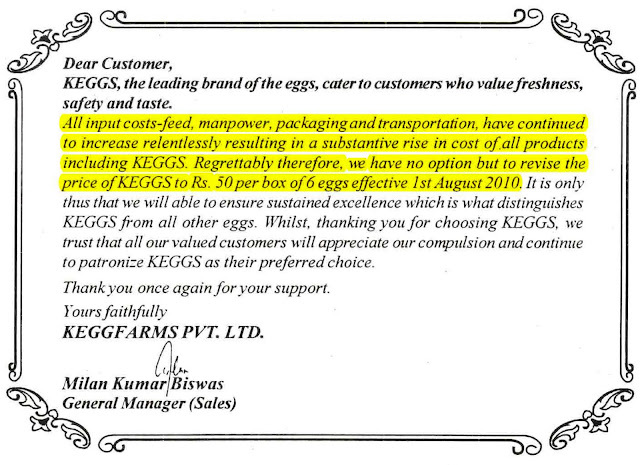 In a note addressed to his customers, stuffed in a box of eggs, he announced an increase in the unit price of his eggs. Input costs for feed: read food grains and other food items. Packaging and transportation costs: read a mixture of wages, services and fuel prices. This points to something more than just food inflation. Mr Kumar, just like our RBI Governor, seems to suggest that price pressures are indeed quite generalised. On 1), we knew about food inflation from the the WPI and the CPI. What is novel is the information on the pass-through to processed food items from unprocessed ones. It is a clear example of the cascading effects of input costs into prices downstream from the production chain. On 2), unfortunately we have no direct and timely statistical evidence about wages in India. Hence, we, alongside our Central Bank, are left grasping for evidence from anecdotal and piecemeal information. If true, it would be indeed bad news. A input cost increase passed onto wages, i.e. the famous "second round effects". This puts us into something like that classic story of mishandled inflation, the oil shock of the 1970s. On 3), we unfortunately have no clue what are the developments in services prices. Hopefully CSO will soon release a new CPI so we can start seeing some of this. Last, but not the least, can we also trust Mr. Kumar that he will not raise his markup in a period of ongoing recovery of demand? Economists have long disagreed on this question. See the seminal papers by Rotemberg and Woodford, and, more recently, Ramey and Nekarda. For many years, India has been in a slow processes of evolving towards a dual centre-state GST. The rough picture is one with two distinct but harmonised taxes, which have an integrated IT system so as to sharply reduce compliance costs. A key dimension is that of properly integrating domestic taxation with international trade in goods and services, by zero-rating exports (thus exempting non-residents) and by charging the GST upon imports (thus taxing the full consumption of residents). This process has faced two challenges: politics and administration. On the political side, the puzzle lies in having enough states sign up into a system where all taxes other than the GST are abolished, and where firms face an integrated nationwide administration. This would enable a unified Indian common market. Things seem to be going badly on that front. The administrative challenge is one of project management. The Indian policy landscape contains many important ideas where the political hurdles have been crossed, but where execution has been lacking. Today there is news of a concete project management strategy for the GST: see this story by Surabhi Agarwal in the Mint. So while there might be many failures on the political side of the GST, atleast we now know that there will be some coherent project management which will yield a working GST system within a year or two. The idea of bringing NSDL into this problem is not new. Ever since the Tax Information Network (TIN) was built by NSDL for the income tax department, it was well understood that handling of VAT credits is much like handling of TDS. In 2004, the Task Force on Implementation of the FRBM Act, chaired by Vijay Kelkar, had said in the executive summary: ``Hence, the Task Force recommends that the existing TIN and OLTAS systems, developed by CBDT, should be used for the implementation of the GST, both at the Centre and at States.'' We wasted a lot of time in getting to this destination, but while the wheels grind slow, they have ground true. When NSE and NSDL came about in the early 1990s, we had little idea about the far-reaching consequences of what was coming together. Also see: M. Govinda Rao in the Business Standard. The Indian authorities are in the process of pushing listed companies to have atleast 25% shareholding with outside shareholders. I wrote a column in the Financial Express, titled Outside shareholding and market liquidity: Indian empirical regularities where I look at how size and outside shareholding come together to matter for stock market liquidity.